The Novation Circuit is an innovative digital synth and drum machine which offers maximum creative control in a portable and versatile unit. Housing a 2-part synth, 4-part drum machine, 32 backlit velocity sensitive pads and 10 rotary encoders, the Circuit is the perfect tool for step sequencing professional sounding tracks on the go or with your DAW. With the ability to be powered 4 x AA batteries and featuring a built-in speaker, the Novation Circuit offers premium Novation sounds and samples in a portable unit capable of creating and playing back tracks on the go. The Groovebox's included Nova-heritage synths allow electronic sequences with ease, all supported by textured drums. Includes Ableton Live Lite software and 4GB of Loopmasters samples. Sound Collective is a cutting edge collection and source of inspiration for Novation users who are after new sounds. 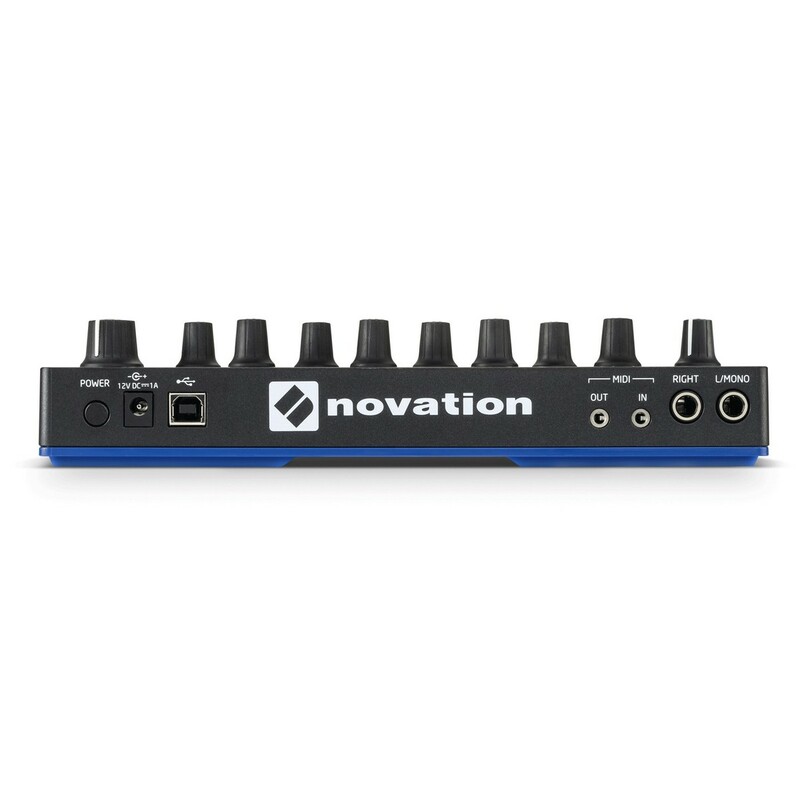 By simply owning this Novation product you have access to a stream of new synthesizers. Simply register your product to access these incredible tools. With new instruments every month, you'll never be short of ideas. Be the best you can. Melodics is a desktop app that allows you to get the best out of your Novation. Obtain 15 bonus lessons for free and start your journey into music mastery. New tools for your creative workflow. 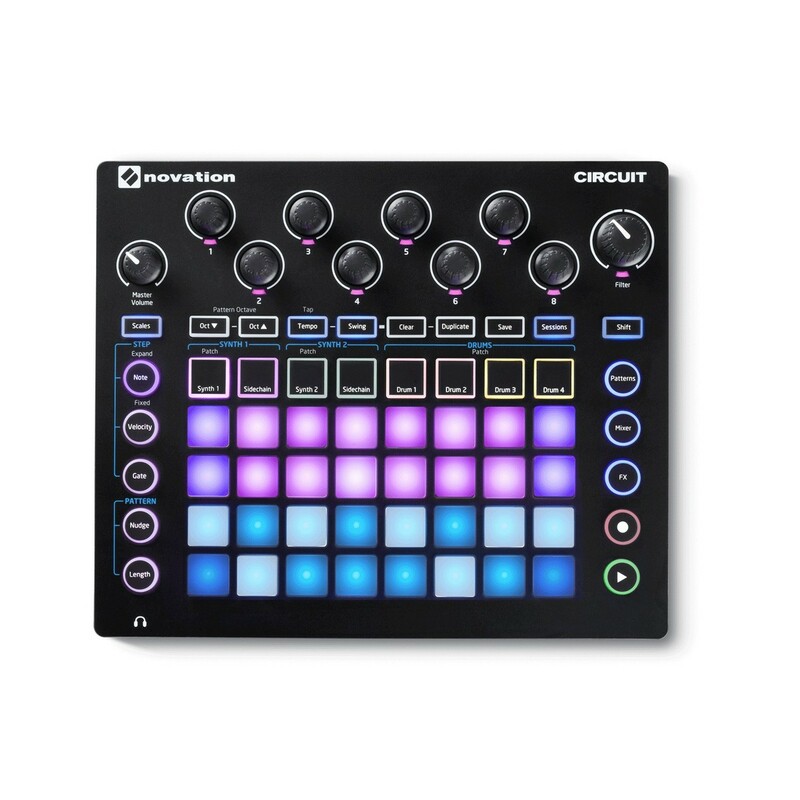 Novation's continued work on the Circuit Groovebox is now on its 1.8 release. With this new firmware update, you can utilise a number of great tools to get the most from your music. Non-quantised recording means you can go off the grid with your sequences, allowing you to sequence drums and basses in micro steps. There is now assignable MIDI channels as well as per-note velocity tracking. With a fresh update, comes new reasons to love your Circuit. Circuit Components is a new set of tools expanding on the features and functions of the Circuit, giving you the ability to create and customise your own unique sounds and instruments. One of the most prominent features is the ability to import your own samples, opening up a whole world of possibilities for your productions. You can import your favourite MP3 or WAV samples, with 60 seconds of space featured across 64 slots. This feature is perfect for a range of sounds and instruments from drums and one-shot vocal samples to quick chords and synth stabs. Another new feature is the ability to export your samples from the Circuit, creating your own collections and saving them for future reference or collaborating with other artists. Another innovative feature is 'The Editor'. This function allows you to design and create your own complex patches and sounds. The Editor gives you access to every synth parameter of Circuit's two powerful polysynths, utilising technology from Isotonik Studios to create a comprehensive synth editor that gives you maximum control over your sound. The Editor also allows you to access synth parameters on the flyer and customise Circuit's macro control knobs. The Editor can also be used as a stand-alone program, now running on the PC or Mac. Using these new Circuit Components will require the latest 1.2 firmware. The firmware has been updated with new features, added functions and bug fixes to improve performance and workflow. The firmware update allows you to play with other controllers, recording midi notes from external instrument plugged into Circuit as well as recording automation and even utilising your iPad. Another great feature is the ability the automatically sync the Circuit up with Ableton live, allowing you to record MIDI from your session with a few clicks. The Novation Circuit is the ultimate tool for capturing inspiration and creating expressive tracks quick and professionally. Combining a 2-part synthesizer and a 4-part drum machine the Novation Circuit can be used to create interesting and dynamic songs straight out the box. Additionally, the 4 x 8 RBG backlit grid sequencer with velocity sensitive pads offers an effortless and dynamic way to create drum beats and synth patterns. 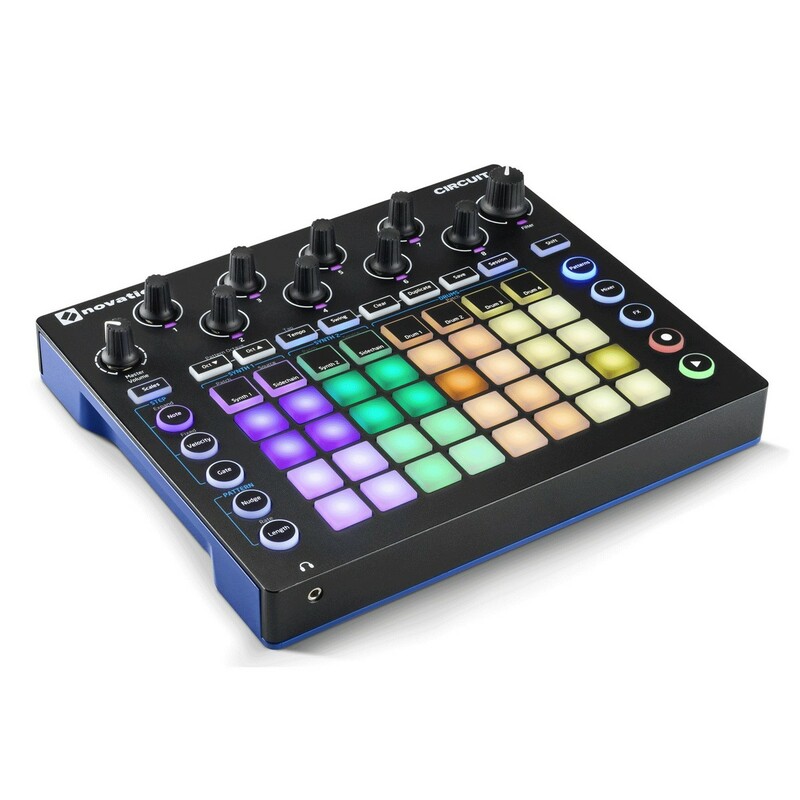 Unlike most synthesizers and drum machines the Novation Circuit can be used in a standalone mode and be powered by either the included 12V power supply or 4 x AA batteries. Without even touching a laptop you can create whole songs. Perfect for beginners and experienced sequencers alike the Novation Circuit features an innovative streamline mode which keeps harmonies, rhythms and melodies locked in tempo ideal for capturing quick ideas on the go. Furthermore, Circuit can also be used to create advanced sequencing patterns whilst the split grid shows real-time feedback of steps and notes. Not only does the Novation Circuit feature velocity sensitivity RBG backlit pads but you can also add unique effects and modulation such as pitch, decay, distortion and EQ to optimize your tracks.